When we learned that Daniel Chong, talented artist and creator of the brand new series We Bare Bears will be at The Annecy International Animation Festival, the deal was done: we had to meet him and talk about animation, webcomic and obviously bears ! As the creator of a new show, were you allowed to choose your team or the production bring some people to help you in that very specific task? Yeah, I mean, I got to choose them, most of them, especially the story artists. I got to choose who they were, if they fit the style, and that’s great, because that’s always as it should be. I’ve something in my head and it’s important that the people in my team can support that vision, I guess. Yeah. I saw on tumblr that Maddie Sharafian worked on the team, I love her style. Yeah, Maddie, she’s amazing ! We lost her recently, she went up to Pixar but we had her for the first half of the season and she come and see us once in the while, she was a beautiful part of my team, she was the one who did the first episode and the first person we hired and I knew from her film, Omelette, I knew immediately that this girl was gonna fit the show perfectly, and she did! She was perfect, so great. Was it hard to go forward with the team, to find the good artists ? Beginnings, especially on a new show, can be tough. Well we picked up the team slowly, it wasn’t right immediately. We slowly recruited the story artists and then they greenlighted the show, we looked out for some people but they weren’t available at the time… I came down in April, not last year but the year before that and we didn’t really start moving until probably August, something like that. It was a very small team and then it started to ramping up and as I said in the Q/A...Were you there? I couldn’t be there, I was on another interview, my schedule was too tight. (laughs) Oh I understand, I’m not upset ! I talked about, you know, how it’s very hard to find story artists and people for our crew. We had an hard time to find an art director, and it had slowed down the whole process, but we found one out eventually. It wasn’t just that fast, it wasn’t the right time. So We Bare Bears is a fully boarded show ? Yeah, it’s based on an outline that the board artists have to write, to compose and everything. It’s a lot of work. Yeah, totally. Does the formula of the show is similar as the one from Regular Show ? With an equilibrium state at the beginning, the accident which makes the characters going to their adventures and a return, at the end, to that same state? Yeah. It’s very typical for a TV show. In a movie, who want to arc them and change them and the difference in TV is that you want to arc them ad also bring them back to what they were originally. That’s a bit challenging and you have to think smaller in terms of “what the problems are, what the stakes are.” It can’t be life or death. You have to be more subtle on the kind of issues they have to deal with, a part of the problems will be the dynamics between the characters. They’re brothers, and there are siblings’ problems like that, and we had to create a lot of plotlines already. So, how does it feel to be the boss, the man in charge ? How you deal with that? It’s different (laughs). I’ve never been in charge of anything like this, you know. Before that I was mainly a story artist, so I was basically working under a director with him telling me what to do. So it’s a big switch to be on a show and mainly have to translate how I want things to other people. It’s a difficult process to teach people that. The only way I’ve found to handle it right now is to be at every meeting, as much as I can, and being involved in every story meeting, to keep watching the story artists, make sure that they stay on track. I have a director, he’s good and he’s able to help and to be be a second pair of eyes for me, but it’s a big change for sure. I mean, doing a webcomic is just free time and there’s no consequence: doing some art, having fun, it’s just a silly, personal and all that. But now, it’s a job. I have to manage these people and also satisfy the studio, make sure they’re happy with it. There are a lot of other considerations. It’s a very different mindset, for sure. Are there some interactions between the different teams inside Cartoon Network? We know you’re all in the same building, are there some ideas traded between all of you? Does it even happens? Oh, we’re so busy, so occupied that you don’t really get a chance to see them. We share our side of our office with Uncle Grandpa and we barely talk to them, plus it’s a very different kind of show, a different sense of humor, so we don’t talk that much, between the teams of the shows, of course. We’re all friends and when we began, they were nice and showed us what their process were and how they worked and we started moving and nobody talks to each other. But I know a lot of these guys, I went to school with them, JG Quintel from Regular Show was in my class, Pen Ward was a year above me, Pat McHale, from Over The Garden Wall was in the same class of me so we all know each other from way back, ten years ago, but we really have no time to talk. You’re working, like, in a bubble? Does the original concept of Three Bare Bears, the webcomic, changed along the process to become a show? Yeah. There was a lot of things that really changed. The art direction, we talked about that earlier. And the storytelling too. The pilot was only seven minutes, and when we had to turn it to an eleven minutes show, it’s a lot of time to fill and trying to figure out what the storytelling is from that length was very difficult. We had to do two board before making the pilot and Maddie did one and I did one and Maddie came in way too long and mine came in way too short.We didn’t know what to fill to get these eleven minutes and we just had to learn as we went: what does an eleven minutes episode feel like? How do you create a template for the show which could be like, every episode? So there was a lot of challenge in translating it. It’s a time where it can be very difficult, with the boards’ length. It was definitely a challenge. And the webcomic, like the writing, there was a big change. Because in the webcomic I wrote that like, a stream of consciousness so I never knew where the story goes. I would come up with new jokes in every panel and somehow find a way to end it. But writing for the show is more traditional, in terms of storytelling, so there are “act 1, 2, 3”. It's much more classic in the way to convey the story, so we have to plan ahead what the story is about, what's the paying off, the action to get there and what's inside these actions. That was some very different considerations and we had to learn from that. How did you created those characters? What are their origins? The characters were created when I was trying to make laugh my girlfriend’s niece. We were at the library and I was doodling these bears and she found them very funny. So from there I created the webcomic and just like, made a couple of them. I’m pretty sure it had to do with the fact that in California, there’s a lot of bear stuff there, like a school, a lot of bear statue there, so I’m probably sure all those things collided in my head, so that’s my inspiration for the show, by living in a bear area. How did you get that idea to make those bears living in an human world? It reminded me a movie I love, Fantastic Mr Fox. Oh! We love that that movie, and I love what Wes Anderson does. We watched it a lot as a reference, saw how they told jokes, how they staged things. It was very inspirational for us, we really like it, and I love the music. Sometimes, we used its music as temp music in the animatics, because it has a nice tone. 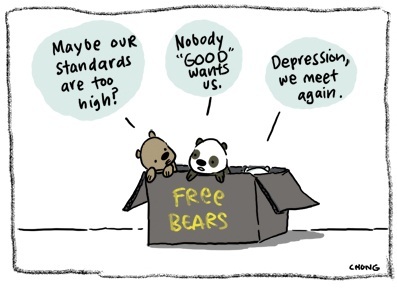 And I think the bears are trying to fit in somewhere they don’t belong, but they really want to and it’s something I think we all can relate to, you know, just trying to find a place in the world, and sometimes you don’t feel like you fit in. Bears definitely don’t because they’re not humans. Thematically it has strong visual for that strong idea. It accentuates that needs, the things they care about. Daniel Chong has opened a Tumblr to share We Bare Bears art with the audience, called We Draw Bears, and also has a Facebook page, CNWeBareBears, and a twitter, @threebarebears. 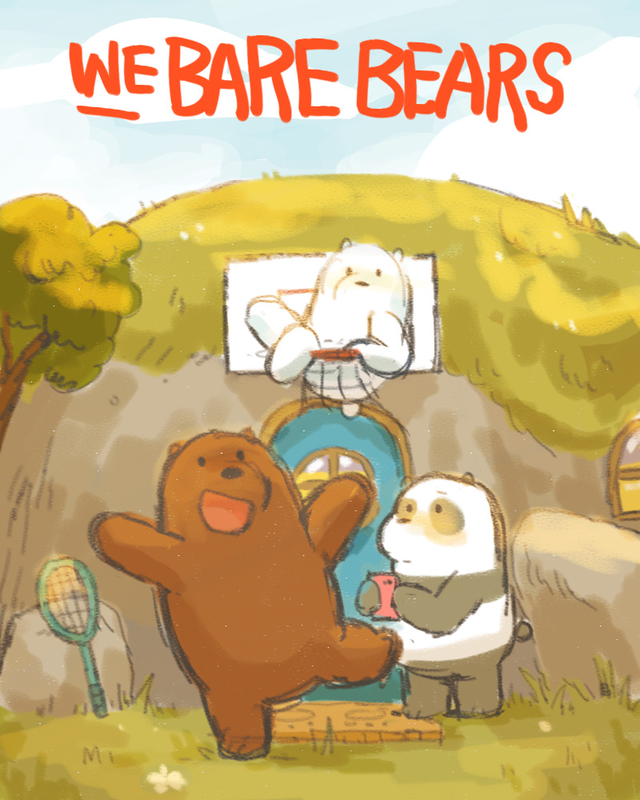 The original wecomic, Three Bare Bears, is still available here. 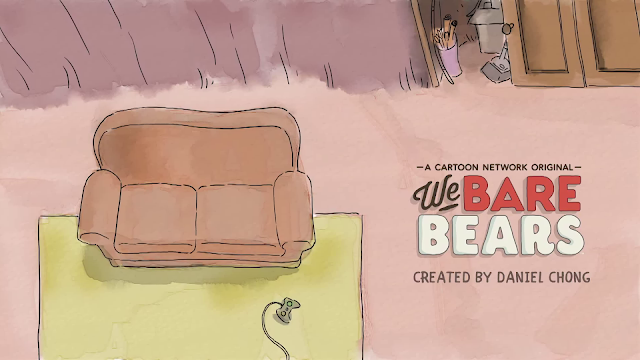 The US TV premiere for We Bare Bears on Cartoon Network begins tonight at 6:30 PST! Stay tuned ! Many thanks to Valerie Leroy from Cartoon Network France for her help and management by making this interview possible. This joint interview was done by Muriel Salzard and Nicolas Burki. To read this interview in french, click here !